Steam Whistle Brewing is committed to being more than just a brewer of great beer...we want to be a contributor to the social fabric of our community! It is our mandate to support cultural, charitable and community-based organizations and events. Whether we can assist your organization by hosting cultural and charitable events in our brewery party rooms, or by coming out into the community, we want to become involved. Does this event recur annually? Check this box if so. 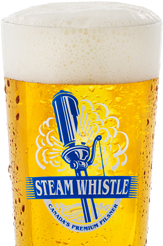 Will Steam Whistle Pilsner be served? How much product will you require?